Dealers are people who can make things move! They are market creators and facilitate the flow of ideas, objects and objectives, connecting sellers and buyers. Dealers make money as a consequence of their ability to move energy and create results. Many people get locked into patterns of behavior that can prevent them from completing a project or bringing a deal to fruition, and receiving the profit, benefit or enjoyment that is possible. What deals will you not walk away from that are costing you more than you know? The 5 key characters that you need, to be a dealer and make money. Are you speculating about making money rather than making money speculating? What is BIRGing and are you using it to disadvantage? Do your investments resemble losing football clubs that you loyally support with your money? Treasure Hunter, Collector, Bargainer, Speculator and Investor—which are you using to your disadvantage and how do you turn that around? 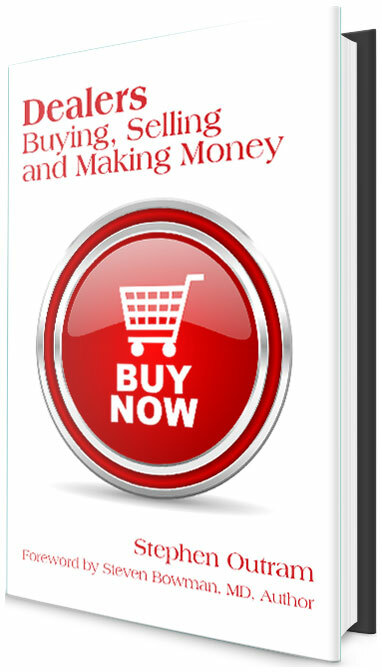 The ideas, concepts and tools that this book contains will connect you with the dealer that you have always wanted to be, but have not yet been introduced to; until now! "I have so enjoyed reading this book, it is clear, precise and easy to read with some great tools to add to your life. Before even reading the entire book I started to implement those tools in my own practice with some phenomenal results for myself and with my clients. I thoroughly recommend this book"—Liam Phillips, Author, Curing the Incurable. "This book provides a different way of looking at how people choose to function. The various personas of Treasure Hunter, Collector, Bargainer, Speculator, Investor and Dealer all have implications for how we choose to interact with the world around us, and greater insight into how we choose to be in any situation. When you read this book, you will ask yourself all sorts of questions like, “Hmm, I wonder where I am being that?” or “Interesting. How can I use that to my advantage?” Congratulations Stephen on sharing your unique way of viewing the world in a way that others may find beneficial and interesting. "—Steven Bowman, MAM, MD Conscious Governance. Foreword by Steven Bowman, MAM, MD Conscious Governance.